Joy in the Journey: Water, Water, Water - Let's Talk Hydration! Water, Water, Water - Let's Talk Hydration! So I am absolutely sure that if you have taken steps to be healthier, you have been told - and maybe tell others - about the importance of drinking more water. But do you know why? Maybe you've heard random percentages thrown around... like 90% of your body is water. Or 50%. Or 75%... Maybe you've heard other reasons to drink more water. I recommend it for my challengers, and I strive to drink more myself. What are my reasons? I try to drink more water because the ideal body water percentage for women is 50-60%, and the moment I feel thirsty I have already lost 2-3% of my percentage of water. And did you know that you become mentally impaired and uncoordinated at only 1% loss? I learned that while researching for this post. So every time I work out, every time I sweat, I am actually contributing to my own uncoordination... UNLESS I make an effort to drink more water to compensate. Did you also know that you lose approximately 9 glasses of water simply by doing normal every day things like breathing and urinating? Crazy, right? I also drink water because it helps to curb my appetite, especially when I am "hungry" simply because I am bored. It also helps when I believe I am hungry but am actually thirsty. Water also keeps my inner workings working smoothly. It keeps my kidneys functioning well. It keeps things "flowing" to keep me "going." So, a 150 pound woman would look like this: 150/2 = 75. 75/8 = 9.35 cups of water. I would recommend that 150 pound woman round up to 10. How do *I* get in my water? 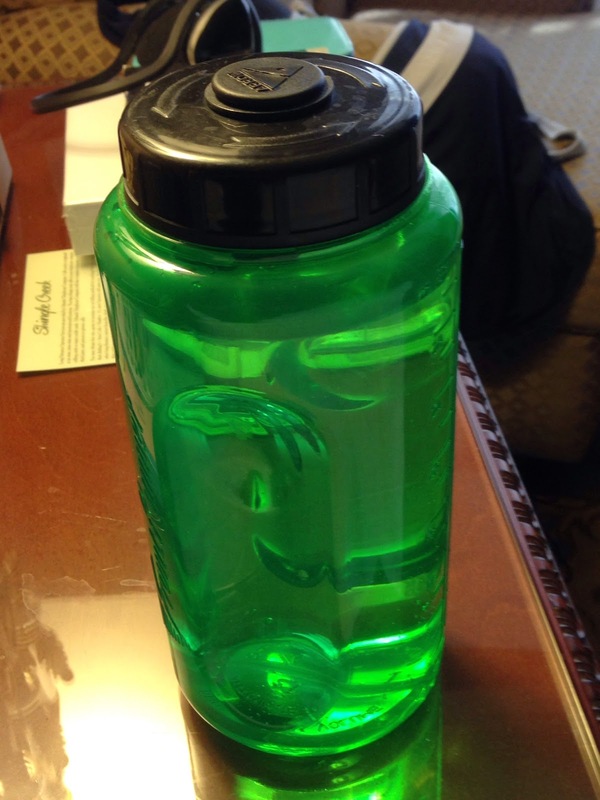 I carry this around all day and aim to fill and empty it at least 3 times per day. So what are you suggestions? Do you try to get your water in? What are your strategies?